Forty-Five Plus Years – Wow!!!! Someone, possibly me, once said that if you find a job you love you will never again work another day in your life. That speaks well of my time here at the Law School. My work here has been, with all apologies to “She Who Must Be Obeyed,” a love affair. But my goal, leaving here as a graduate, was not to become a Law Professor. I wanted to be a lawyer who would spend most of the time in a courtroom. That is how I started, but then came the phone call. It was from Professor James D. Ghiardi, my most favorite teacher during my three student years here at the Law School. He asked me to join him as his assistant at the Defense Research Institute (DRI). It was a national think tank for lawyers who defend insurance and personal injury litigation. It involved a lot of research, writing and editing. It was then and there I learned, for the first time, that Jim had two full-time jobs. My initial thought at his call was pride that he would seek me out to join him. I also came to the conclusion that if I did not like the new job I could always go back to the courtroom. But I did not go back to the court room. But how did I end up in the classroom? The first step again relates to Jim. Shortly after I began my work at DRI, Jim was elected President of the State Bar of Wisconsin. I believe that Jim remains the only academic lawyer ever to be elected to that position. Nevertheless, shortly after the election he came to me and asked if I would teach his Insurance class at the Law School during his term as President, because of his time constraints. I soon learned what having two full-time jobs was like. Jim returned from his term as president to tell me that he wanted to teach a different course and that the Dean (Bob Boden) had approved my continuing on with Insurance – step two. 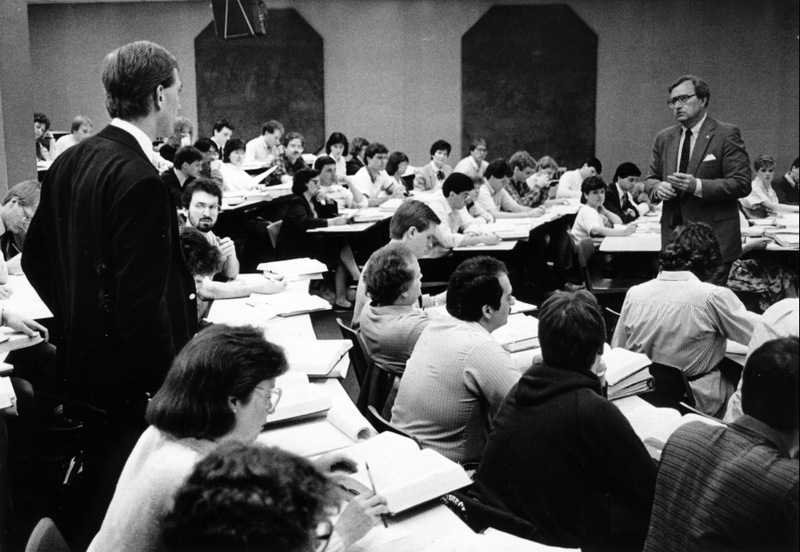 It wasn’t long thereafter that the Law School decided to section first year classes – from 160 students in one section to 80 in two sections. At that time, Torts was still a two-semester course. Dean Boden asked me to teach one of the new sections, I am sure at Jim’s urging – step three. Jim left DRI in the early 1970’s, and I was asked to replace him. Now I really knew what two jobs was all about – a full load at the Law School and running a staff of twelve at DRI. Fortunately the two offices were only a block apart. In 1982 I decided that two full-time jobs was one too many. In addition to running the Milwaukee office, the DRI job involved a good deal of travel. My children were growing up quite quickly, and I wanted to be a hands-on part of the process. So ever since my sole job was teaching law. But what has caused my love affair with teaching law? It certainly is the interaction with law students. One Ls come to us not knowing what a source is or how to spell “collateral.” But to be a part of their evolution is just fantastic. Day by day and week by week, the students develop into lawyers. Looking out at those fresh, young faces at that first Torts class, I can’t help but wonder who will be a justice on the Wisconsin Supreme Court or join me as a faculty member at the Law School one day. I have had several of each. One became my co-author on a two-volume book and my co-editor of a quarterly law journal. I have even had a student start in the local U.S. Attorney’s office and end up as a radio talk show host. Many students, quite obviously, become very accomplished lawyers. To be repetitive, I truly love teaching law!! I would have experienced none of this without James D. Ghiardi – my teacher, my mentor, my faculty colleague, my second father, and my friend. I am only sorry that the job had to end. A great law school is not defined by its building. It is defined by the people inside. Thanks for making us great. You were a professor who inspired me, and it’s an honor now to be your colleague.